Have you ever seen a garment of clothing so beautiful that not only is a double-take necessary, but that takes some internal convincing to believe it is walking around on a human body in this lifetime? 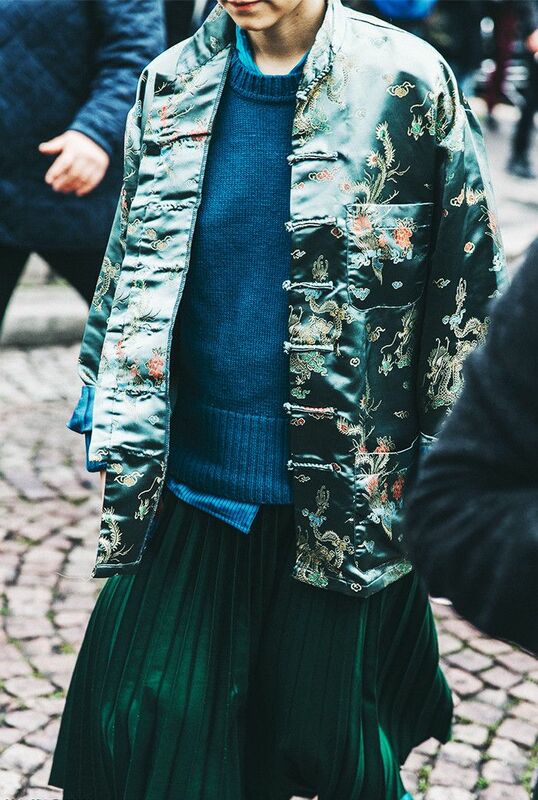 This is how we feel about the Far East–inspired trend that bubbled up during fashion month. Yes, fashion week is a time where multiple new trends are consistently born, but this year, this trend stood out to us for more reasons than one. Street style stars across the board debuted pieces consisting of shapes, fabrics, and embroideries from China, Japan, Korea, and more, each of which was more enticing than the next. From replicas of traditional cheongsams (silk-printed fabrics, high necklines, trims, and all) to Japanese kimonos that have been turned into modern-day bomber jackets, these pieces from the Far East are gorgeous, striking, and definitely deserve a place in your closet. Keep reading to see this striking trend in action, and to shop pieces for yourself. These knotted clasps are just what a basic black blouse is missing. A dress that makes this much of a statement will never go out of style. Your go-to jeans and T-shirt ensemble is in dire need of this jacket. This top deserves a night on the town. The colour orange has never looked so soft. Trimmed with velvet and covered in florals, this jacket is a major hit in our books. No one at work saw these trousers coming. Now this is a sweatshirt we wouldn't mind being seen in. Add some edge to this playful minidress by throwing a moto jacket on over your shoulders. Next up! Check out the old-school trainers everyone's been wearing at fashion week.